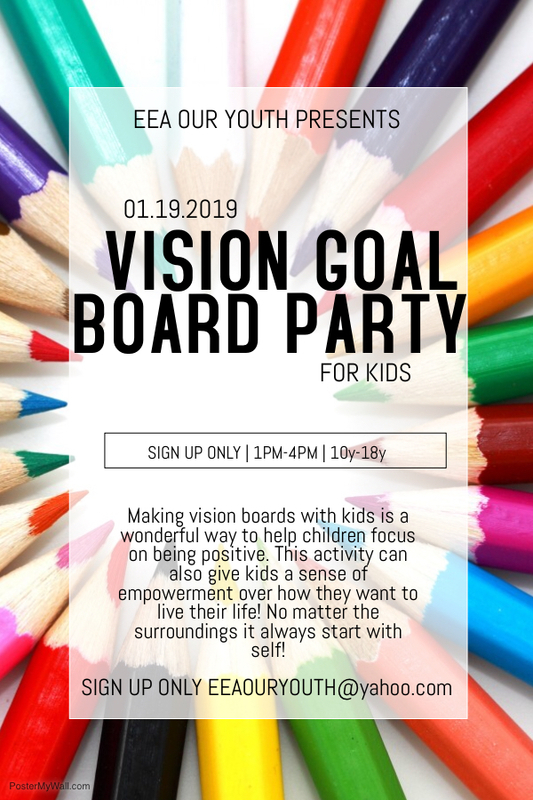 East End Allegiance: Our Youth will be holding a Vision Goal Board Party for kids from ages 10-18 years old on January 19th from 1-4pm. MUST SIGN YOUR CHILD UP to attend. Location will be given to those signed up. Sign up by emailing EEAOURYOUTH@gmail.com. Please sign up with Erica 903-689-6677 or Bridgette 972-802-8705. Deadline is Wednesday January 16, 2019. Want to be a firefighter, nurse, engineer, doctor, lawyer, hairstylist or welder; maybe even own your own business. Let’s set some realistic goals and make it happen! YOU CAN DO IT!! EEA OUR YOUTH BELIEVES IN THE YOUTH ENOUGH TO HELP YOU GET THERE!! Making vision boards with kids is a wonderful way to help children focus on being positive. This activity can also give kids a sense of empowerment over how they want to live their life! No matter the surroundings it always start with self! This is part of EEA OUR YOUTH, Next Level Mentoring!